I've definitely decided to produce feed trained hybrid crappies (Pomoxis nigromaculatus X Pomoxis annularis) this spring. Produced black crappies (Pomoxis nigromaculatus) previously, but albeit they are feed trained I'm not that impressed with their condition factors and growth. And I've come to the realization that the really monster size crappies I get in to mount as a fish taxidermist are natural hybrids. It seems 100 percent of the 17 to 21 inch crappies I get in are natural hybrids. Literature says the hybrids grow faster the first two years also. My black crappies are inside in an RAS but probably won't have the correct photoperiod and temps to use as broodfish, and I'm really not set up to produce those parameters. So will get my female black crappies from a local natural lake as in before and I have access to a reservoir a couple of hours away I will catch my white crappies (Pomoxis annularis) males from. Would like to do manual spawning indoors, start on rotifers graduating to artemis and then feed train all in a tank, but don't really have the tank space. So will plant 5 to 10 broodfish in a fertilized 1/10th acre pond and let them do their thing. Five male white crappies and five female black crappies. Unlike with the previous black crappies I will NOT add fathead minnows (Pimephales promelas) for the broodstock. They ended up competing with the crappie fry! Got to speak with Bobby Glennon biologist at Malone and Sons fish farm in Lonoke, AR USA. This is where a significant amount of research has been done on hybrid crappies both by the hatchery and by a university. Great person to talk to btw and not only does he know his stuff, he is professional, polite, and was happy to answer my questions. Wish I could say the same for some others in the aquaculture field both farmers and academics. 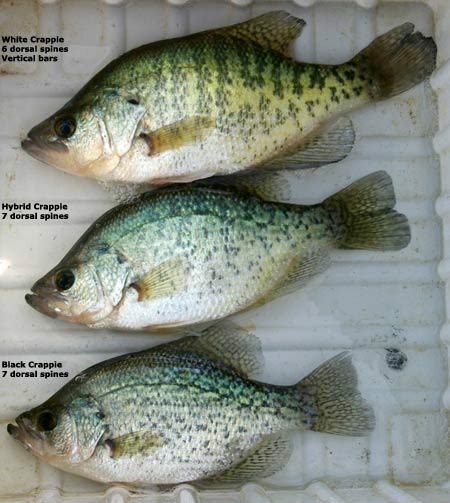 It appeared to me there was a contradiction with the sexes used of each species as the SCRAC pub says to use female black crappie and male white crappie, but Malone and Sons lists along with Mississippi Game and Parks lists the opposite. Bobby told me they prefer the White female but getting them in sync with the blacks wasn't that easy and the black crappie female worked just fine. He also said research elsewhere has shown F1 recruitment is so poor for just the hybrid crappies, Malone and Sons no longer goes to the trouble of producing triploids. It's just not needed and it's tough to get the numbers they need producing just triploids. Pond is ready to add the broodstock as soon as water temps permit and the rotenone treatment detoxifies thanks to a friend with an applicators license. Didn't want to waste water and pump up new water when I can remove any existing fish with rotenone. Will get the male white crappies and female black crappies via angling in the next few weeks.